← Wine On the Rocks…with a twist. Marinate beetroot in 1/8 cup of red wine vinegar, 1/4 cup of extra virgin olive oil, salt and pepper, leave overnight. In a small saucepan, lightly fry the carrot and celery until soft (approx 1-2 minutes), add the cooked lentils and the sprigs of thyme at the end, season with salt and pepper. Add a dash of the red wine vinegar and drizzle with extra virgin olive oil and set aside. 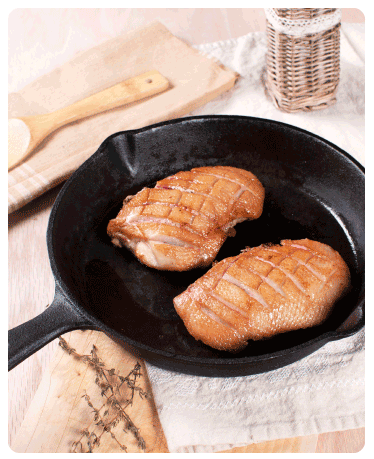 Place duck breasts skin side down in a skillet on the stove, over a low heat and season with salt and pepper. Cook for approximately 20 minutes, skin side down. When the skin has turned golden brown and crispy, turn once and rest for 15 minutes. Place the steamed endive in the center of the plate with lentils and beetroot placed around the plate. Slice the duck breast skin side down and place on the endive. Glass-staining ruby. Cherry, cassis and pipe tobacco on the fragrant, oak-spiced nose. Offers an array of sweet dark berry flavors and notes of vanilla, mocha and candied licorice. The cassis note lingers on a long, smoky and attractively smooth finish. This wine drinks very well after a brief decanting. This entry was posted in Recipes and tagged Cabernet, church block, recipe, Shiraz, wine, wine pairing, wirra. Bookmark the permalink.